The Heritage Center is a great place to host an event. If you're looking for information about wedding venues, please be sure to check out our Weddings and Receptions Page for rental rates and more options. The Bell-Tierney Farmhouse, built in 1884, can be used for many occasions. This beautiful setting could be the perfect, elegant setting for your special event--small weddings, receptions, adult birthday parties, family gatherings, a special tea or luncheon, even a holiday party. A unique meeting place for many occasions! The Farmhouse is both heated and air-conditioned so can be used year around. It is filled with museum artifacts that represent the New Richmond area over the past 150+ years so has built-in entertainment of a very distinctive type. The farmhouse can be set up to seat up to 60 people on the first floor for a sit down meal. An open house style event can be more flexible. Please realize this is a house so those diners would be spread throughout several rooms with different types of tables and chairs to accommodate them. There is a steep, but functional, ramp at the kitchen door for better access for visitors with walkers and wheelchairs. There is one bathroom on the first floor and a second one on the upper floor. An additional $40 is required if the renter chooses to use the dinnerware, serving pieces, silver and linens that are available in the farmhouse. Renter is responsible for washing and putting away all items with the exception of linens. Linens will be cleaned by the Heritage Center. Some of the items available for use in the farmhouse are: full dinner settings for over 75, punch bowls and cups, large coffeepots. This modern example of an old machine shed makes a wonderful location for events such as graduations parties, wedding receptions, family reunions, and other programs. The Pavilion showcases some of the sturdier, farming and lumber artifacts but leaves the main, central part of the building, open for organizing your event your way. The Pavilion can seat 80 people at one sitting and an open house can be much more flexible. There are eleven banquet tables and 120 chairs for your use. The picnic tables on the patio. There are separate men’s and women’s bathrooms and a utility kitchen with range, refrigerator, microwave and a restaurant-style sink. The Pavilion is easily accessed by wheelchairs. The Pavilion is available to rent from May through October. For an additional $25 user fee there is dinnerware, flatware, cups and serving pieces for 80+ available. Renter is responsible for washing and putting away all items. There is a large charcoal grill, which must be cleaned out if used. 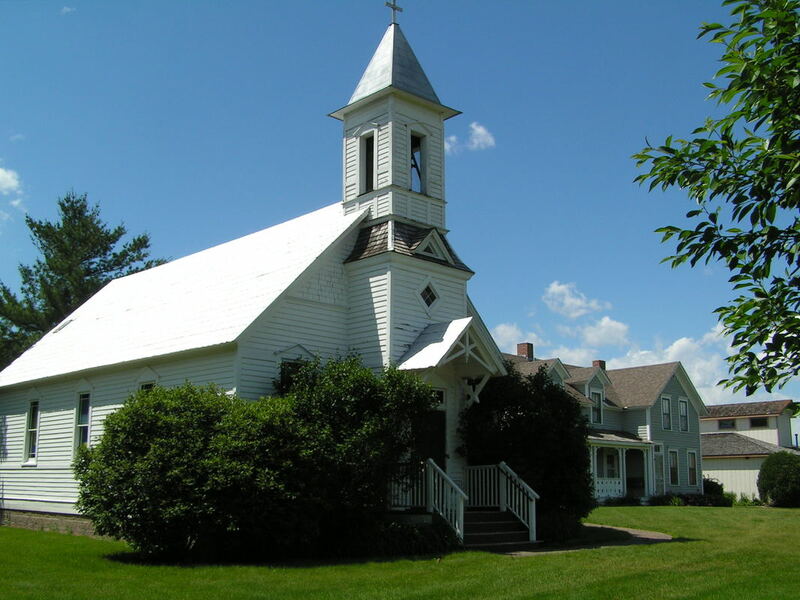 The Heritage Church, originally built in 1891, has seen its share of weddings, baptisms and funerals while in use by its congregation in Superior, WI. Since being moved to the Heritage Center it has continued as a place for weddings, funerals, baptisms, worship service and even as a unique venue for a craft sale. This multi-purpose building is perfect for an event where seating 120+ people while having space to present the program is needed. The church is very comfortable in the spring, summer and fall but it is not heated for winter use. When you rent the Church you also have the use of the restrooms in the Pavilion during your event. The Church has four wide wood steps for access. Use of the bells in the tower is encouraged. If set-up or rehearsal time is needed the evening prior to your rental event, there is an extra $50 fee if that date is available. This must be arranged in advance as it will need to be included on the schedule.